Once upon a time, there was a bay in Fethiye. It was a beautiful bay; perfect shape when viewed from on high as you walked around the Fethiye peninsula. Rocky promontory, encroaching pine forest, crystal clear water, horseshoe bay. Every time we looked down on Büyük Boncuklu Bay, it just looked so inviting. Now that Büyük Boncuklu is JJ Beach Park, the bay doesn’t just look inviting; it lives up to expectations when you get there, too. You see, in years gone by, what looked so inviting from on high was a different story once you got to sea level and to Büyük Boncuklu, itself. This was the bay where so many people came to barbecue and picnic and, over the years, a mound of rubbish had formed. In the wind, it would blow around the bay and the roadside nearby. What should have been an idyll was a depressing example of what we humans do to damage these precious areas. But, let’s not dwell on that depressing image because, now, all that has changed. In 2017, Help Beach & Yacht Club was created at the little sister bay, Küçük Boncuklu, just next door. Büyük Boncuklu – our subject of this post – received its delivery of sand, too and a small beach bar was built. In 2018, the bay became JJ Beach Park and, after being on our radar since the previous summer, we finally got round to heading there in June – another piece of the jigsaw towards our Fethiye Beaches listings. We were with friends who are far more beachy than we are. They’d been to Help a few days before, we’d headed out together for an afternoon at Aksazlar and now it was the turn of JJ Beach Park. They were hosting a TVF Beach Volleyball tournament so there would be something for us two non beachy people to occupy our fidgety selves with. As soon as we arrived, however, it was immediately clear that we probably wouldn’t be wanting to move too far. 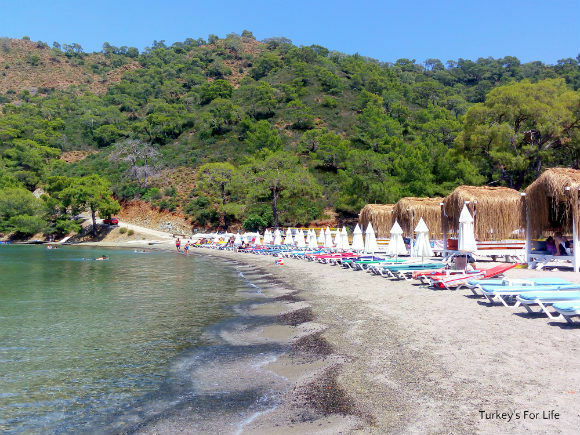 A shaded köşk in the sand, overlooking the bay – and very close to where the volleyball tournament was taking place. We all made a beeline for the empty köşk and, no sooner had we made ourselves comfortable, we had a smiling waiter ready to take our drinks order. This was gonna be a good day! With the school holidays yet to start and Büyük Boncuklu not really on many people’s beachy radar, we were sharing the bay with the volleyball teams and a smattering of other bathers. It was bliss – and just so lovely to see a once neglected bay looking so pristine. A Turkish friend joined us for a while and he, too, was smiling. Like us, he’s often out and about around this area and always said how sad it was that Büyük Boncuklu was in such a mess. Now he was coming here a lot to enjoy it. A paddle along the shoreline (I always have to have a mooch and take some photos) took me past the beach bar and towards the forested curve of the bay. More chillout köşks here, in the hillside. Büyük Boncuklu JJ Beach Park is definitely somewhere we could return again and again, just like the other beaches and bays around the peninsula. It’s difficult to choose favourites, really. The bays around the peninsula all have their own plus points and they all have their own atmosphere and personality. When we were at Büyük Boncuklu, JJ Beach Park was brand new and the staff were still finding their feet. They were doing so really quickly because the service to our little shaded köşk on the beach was fantastic. Later on in the afternoon, we had a quick look through the snack menu just for something to munch on whilst we were lounging around. You can sit in the beach bar or at the shaded tables on the beach if you like but we opted to stay firmly rooted in our little köşk. We ordered a couple of portions of chips just to share between the four of us and, as it was beachy snack food we were ordering, we assumed frozen fries would be delivered to us. But NO! Real homemade chips! Always a happy bonus for us! 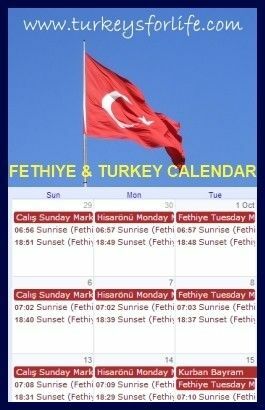 As JJ Beach Park has settled into its home at Büyük Boncuklu Bay, evening events have been organised, too. Friday nights are reservation-only Yamas Meyhane nights. Rakı, meze dishes, seafood and a bit of live music. There’s occasional live performances and DJ sets. If you want to be around in the evening at JJ Beach Park and you’re looking for some entertainment, keep an eye on their Facebook page for updates. Likewise, if you want to be around in the evening and you prefer the quiet life, just watching the sunset, keep an eye on their Facebook page. If there’s no update, you’ll know you’ve got a good chance of a sunset and evening chillout. We’ve long enjoyed visiting the beaches and bays around the Fethiye Peninsula and the arrival of JJ Beach Park at Büyük Boncuklu is really welcome. It’s relaxed and laid back – a place where you can feel really comfortable – and prices are reasonable. The sea is cool and calm and, most importantly, pristinely clean. Long may Büyük Boncuklu Bay remain as part of Fethiye’s beach scene. Büyük Boncuklu Bay (JJ Beach Park) is on the Fethiye Peninsula between Kuleli and Help Beach. In high season, you can get there by public transport every 20 minutes. Take the Taşyaka Karagözler dolmuş through the centre of town and it is the last stop. Not all the dolmuş services go round to the bays so check in the window or ask the driver before you get on. We took a taxi from the dolmuş stop in Fethiye as there were four of us and the price was 30 TL (£5) between us. If you are driving, at the junction just after Marina Boutique Hotel, take the road to the left and head uphill. At the top of the hill where you turn left to walk to Kayaköy, take the road to the right. Büyük Boncuklu is the first bay you come to at the bottom of the hill. Entrance to JJ Beach Park is free. If you are using sun loungers or a köşk, there is a fee for these (at the time of writing, we can’t remember how much we paid for the köşk between the four of us – but it was very reasonable. We’ll update when we visit again). There is a full bar and food is also available. As well as their Facebook page, you can also follow JJ Beach Park on Instagram. 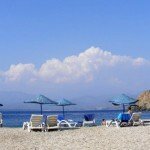 For Büyük Boncuklu JJ Beach Park location – and the location of other beaches in the area – take a look at our guide to Fethiye beaches. There’s an interactive map where you can see all beach locations. And if the beach life isn’t your thing, there are lots of other things you can get up to in Fethiye, too.